AMAZING! More than 200 million people have viewed fireworks and laser shows wearing our 3D Fireworks glasses. These eye-opening glasses have specially treated lenses that bring the light show to your face. Fireworks will never be the same! Call now to find out more details about our exclusive "Buy 4 Get 1 More" deal while supplies last! 1-800-767-8427. 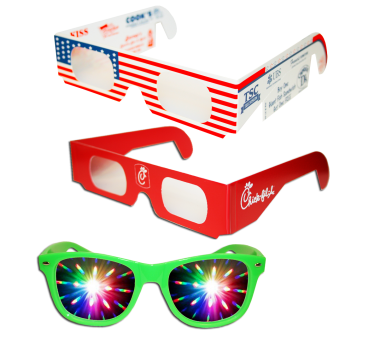 3D Fireworks glasses are a powerful promotional and retail sales item for all national and international holiday celebrations. With a rainbow prismatic effect, 3D Fireworks glasses are perfect for fund-raising and charity events, Holiday direct mail and newspaper inserts, patriotic on-pack promotions, educational and scientific applications, coupon redemption and co-op advertising, and fireworks show sponsor giveaways. Don't miss out this season! Treat your eyes to an amazing light show you will never forget!